Aerogips® is a panel designed for the interior heat insulation of building structures which require maximum level of insulation in the least possible space. Aerogips® is a high-performance insulating panel made up of a nano-technological insulating substance containing Aerogel coupled with a sheet of plaster with high-density coating for excellent heat-acoustic comfort. Aerogips® has been designed for the energy requalification of existing buildings, for rehabilitation and restructuring, where interior jobs have to be performed while safeguarding spaces. It also permits designing new walls in all those buildings where dry systems and lightweight walls are used. Aerogips® is suitable for both vertical partitions and for false ceilings. 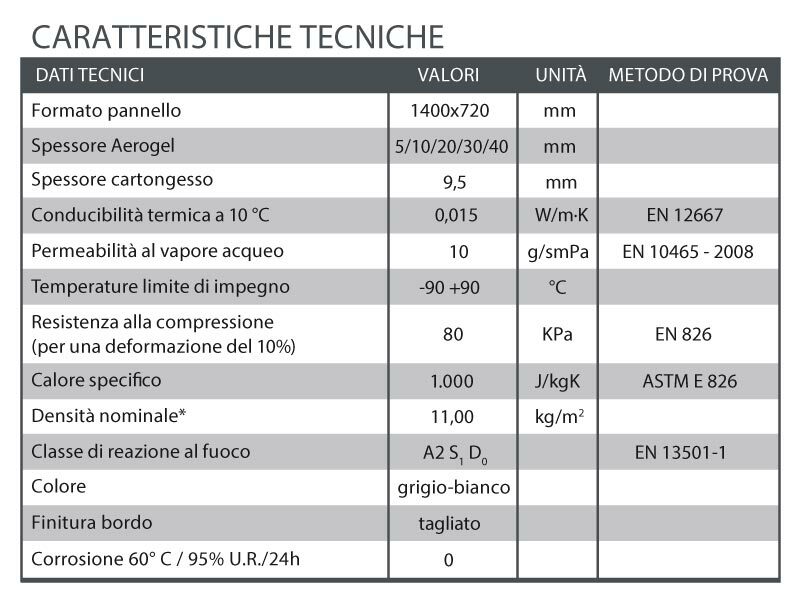 With thickness of only 20 mm and heat conductivity of 0.015 W/mK, Aerogips® permits reducing energy dispersion and recovering space in residential and commercial building applications. Aerogips® uses coated plaster panels with a thickness of 9.5 mm and is available in different thicknesses and dimensions. It is also available in different technical variants: standard, with vapour barrier, water repellent, water repellent with vapour barrier. Aerogips® is an ideal product for interior restructuring, building rehabilitation and historical buildings subject to architectural restraints and whenever greater living comfort is required, thereby considerably reducing installation times and costs. Realization of interior heat insulation, for vertical and horizontal surfaces, such as walls, floors, ceilings or the like, made up of a pre-coupled rigid panel, consisting of a layer of silica Aerogel reinforced with PET fibres (felt), of the Aerogips® type, water repellent and breathing, coupled with a sheet of coated plaster, supplied in 1400×720 mm panels, with a total nominal thickness of 20 mm (or in panels with thicknesses 30 mm, 40 mm, 50 mm) with heat conductivity 0.015 W/mK, heat resistance Rd 0.67 m²K/W per cm of thickness, working temperature between -90°C / +90°C, fire reaction euro class CS1D0, impermeable to surface water and/or immersion with water contact angle not below 150°, finished with careful filling of joints, installed on flat, vertical or horizontal surfaces after full-spread gluing and installation on smooth, dry, dust-free and perfectly integral surfaces devoid of any roughness at all.